Early in October my Mom, sister and sisters-in-law with all the kids ventured out to Gardener Village to see the witches and celebrate the lovely fall weather. Henry was the only kid who took up the chance to go on a pony ride and as you can see he loved it. These pictures ended up backwards, in the lower picture we told Zeke to hold the pumpkin so that we could take his picture and he did not understand why we were making him hold it. After a few shots he decided he was done and chucked the pumpkin on the ground. He cracks me up. 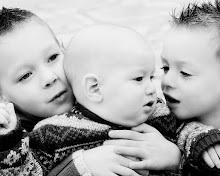 My three cute boys, Henry and William need to take some smiling lessons from P.J. They are still cute though. P.J. got a kick out of the flying bike riding witch, he said it was the wicked witch of the west from the Wizard of Oz. It was a very fun day at Gardener Village, even if we were with a bunch of witches. How fun, I have never been and it looks so cute. Your boys are so cute and Will is getting so big. Put up more pics so I can see everyone. I really miss Utah especially since you and your family are all there, Christopher sure misses your boys too. Don't let Holly watch your kids!